Brad Feuerhelm rubs shoulders with Maciej Pestka’s self-published photobook The Life of Psy and gets a glimpse into a hilarious case of mistaken identity. Maciej Pestka’s The Life of Psy is a brilliant navigation between the borders of fame, photography, and the complexities of credence sought through images. 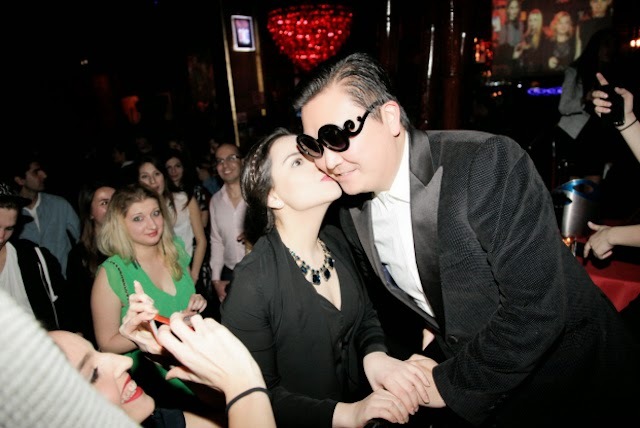 During Barcelona Fashion Week in 2013, Korean-born, French-raised Dennis Carre attended a whole host of parties and events in which people throughout the fashion and beauty industry wrongly identified him as K-Pop singer, Psy of ‘Gangnam Dance’ fame. Quick to capitalise on the doppelganger syndrome he represented, Carre’s appearance takes on a surreal façade as he tangos and kisses his way through a bevy of fashion mavens at various parties, where his image or rather the image of an international superstar administer Carre attention to acts of debauchery and trickery. Maciej Pestka’s photographs themselves are event-type images where the rules of composition and pictorial photographic systems are reduced to a pop-and-flash candid mimicry much en vogue in fashion circles at present. But the point is not really about the quality of the photograph itself, but that of the embrace of spectacle and fame. Clever not to present Carre’s audience as too vacuous or vain, the photographs become a totem of celebration and “I was there” type of infamy. Brilliantly paced throughout the book are shots of Carre at work, partying and living up someone else’s life. Added ephemeral documents such as ‘cease and desist’ letters from Psy’s management add further umpf to the joke and bestow added value to the book as spoof and document of the existential trauma of where belief and need reside. Piotr Drewko drops in on Kuba Dąbrowski’s solo exhibition at Walsaw's Zachęta – National Gallery of Art, Poland. Kuba Dąbrowski’s exhibition titled A Drama Feature Film of Polish Production is a vibrant attempt to create well-structured visual correspondence based on artist’s long and fruitful escapade with photography. Entering the gallery we are faced with a chaotic, yet pleasurable space filled to capacity with a vast number of snapshots and portraits from Dąbrowski’s past. Having read the curatorial statement we’re starting to grasp the principle narrative stream, which is a very personal and intimate portrayal of artist’s adolescent experiences, friends, spontaneous situations and palpable borders of now and then. What is emerging from rhythmic visual tensions is a certain diaristic photography. Dąbrowski’s exhibition does not formulate conceptual method, which situates the viewer at the intersection of art, philosophy, semiotics or science. Instead, the material presented is simply fiction-augmented documentary selection of artist’s life experiences, smattered across the white cube. And while it seems choreographically careless what becomes vital is his ability to effortlessly translate the spirit of experienced situations and events. The viewer does not see anything that is beyond traditional representation but at the same time he becomes hypnotised by on-going dialogue arranged by the artist. We do not see any seeds of revolution in the way he operates the camera - it is rather very conscious and stimulating evolutionary journey through life. Dąbrowski’s work can be described as simply capturing visual coincidences, which happened to occur within his sight. A major facet of Dąbrowski’s practice is the engagement of our memory and collective experience. The sense of superficiality is reduced before the artist presses the shutter, which generates a strong feeling of familiarity in relation to every single depicted situation. By acknowledging that fact we are able to strengthen the relationship with presented images and address ourselves as participants in that particular conversation. Dąbrowski simply changes our positions as viewers: from being a passive audience we’re starting to actively contribute to the story. All the photographs with their synthesis of subjective and objective planes, of past and present articles, of dual and individual creative vision, become an poetic invitation into which new space is created for any individual, who is willing to look. What we see depends on what we look for.